Well, at least if you’re a jaded adult. Kids are routinely awestruck by the behemoths—their size, the glorious mechanical noises they make, the tantalizing mounds of earth they move. If you can stop and look with a kid’s eyes, you will likely be amazed as well. But there is plenty to impress the “adult” in us, with these supremely capable machines suited to a remarkable variety of tasks. The type of machine you see modeled here is one of the most widely used, and Caterpillar’s 390F L Hydraulic Excavator is one of the more advanced in the category. Like so many of Cat’s products, it can be configured numerous ways from the factory, allowing customers to outfit their excavator to suit their specific job requirement. 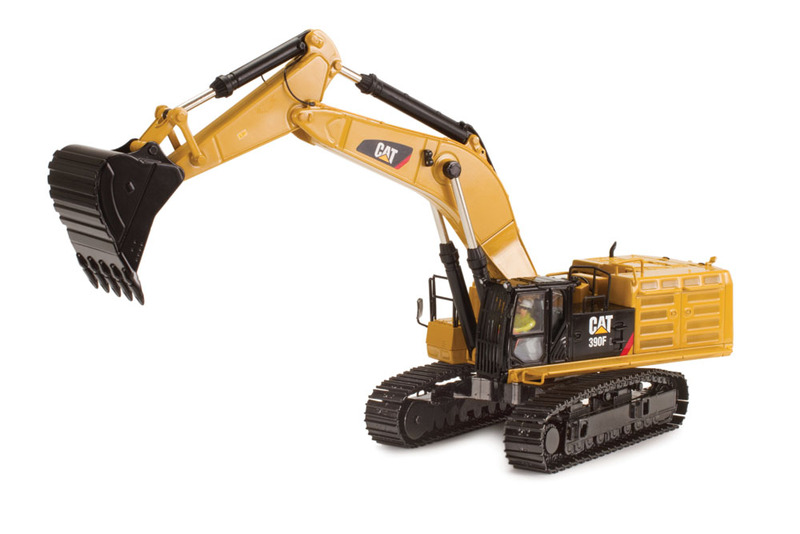 Diecast Masters has become the de facto source for all things Cat in scale, and it has just released this 390F in 1:50 scale and delivers the mastery implied in its brand name. That starts with the packaging. Inside a perfectly ordinary outer box sits a very cool inner “lunchbox”-decorated metal display box, which comes with DM’s High Line Series. It’s beautifully printed with photos of both the real 390F and the model along with a cool data panel, which appears accurate (save for a leftover label that reads “740B Articulated Truck”—oops!). Hopefully, Diecast Masters will get that corrected for the production pieces because the box is a great perk. Now, on to the reason we’re here: the model itself. The first thing that catches your eye—not just because it’s also the handle by which you hoist it out of its fitted foam cradle—is the stick-and-boom assembly. The 390F can be ordered with no less than seven different stick-and-boom combinations. Some quick measurements reveal the model to have the General Purpose (GP) 8.4m boom with the larger 3.4m stick, the most versatile setup for loading and digging that can accommodate the widest variety of tool attachments, of which there are more than a dozen! 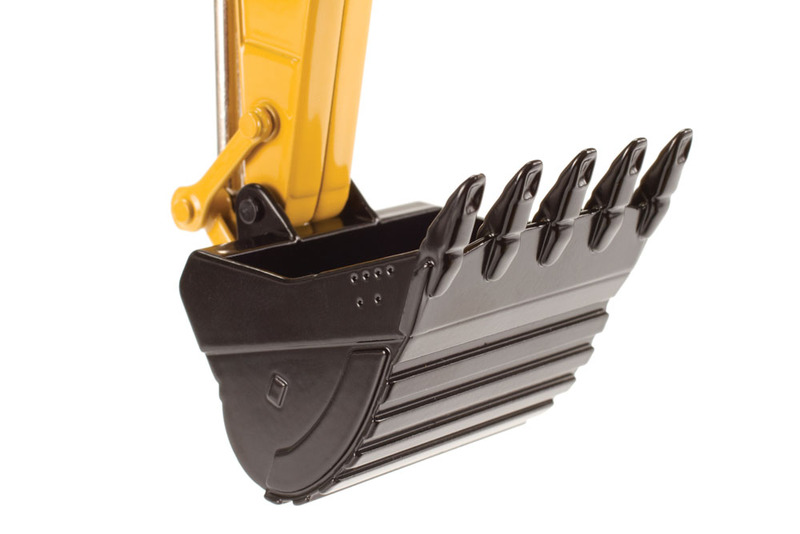 The model comes with the largest high-capacity bucket. The stick-and-boom assembly pivots at the base, at the stick joint, and at the bucket, giving fully realistic articulation with simulated hydraulic cylinders with stainless-steel shafts and plastic bodies, and flexible rubber hydraulic lines. There are also plenty of little surface details like lights, marking decals, and warning placards, and even hose clamps and rivets. The lines run down to a central splitter at the base of the boom and into the superstructure, where the pump mechanism lives. 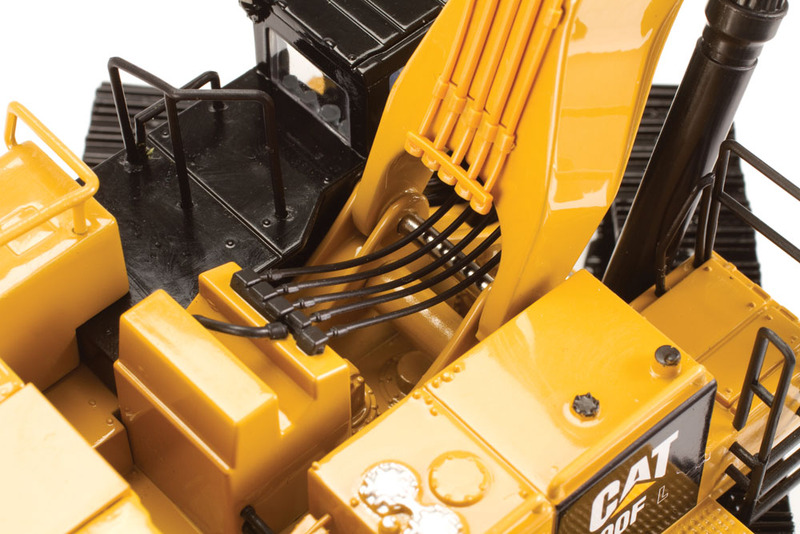 The heart of the Cat 390F is the computer-controlled Adaptive Control System (ACS) valve, which the model captures in nice detail. Running the generator for the hydraulics is a big Cat C18 turbodiesel. 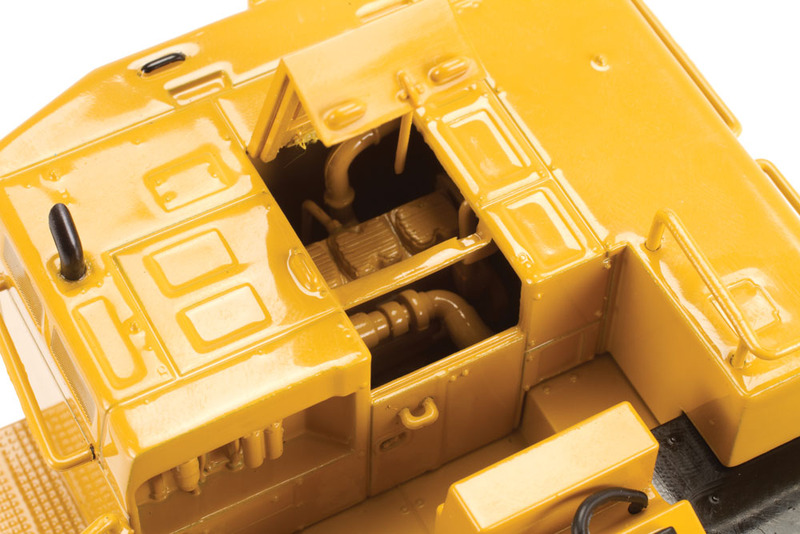 The engine hatch opens to reveal the scale version. The operator’s cab opens, and there is a 1:50 figure at the controls. Perched on the left front of the superstructure is the operator’s cab. The door opens, giving a decent view of the controls. Obscuring that view marginally is a driver figure—a comparative rarity among replicas of most genres. While it does add a degree of realism, the figure detail is not quite up to the standard of the rest of the model (humans are hard to model well), so I’m conflicted as to whether this adds to the model’s presentation or not. This one may come down to personal taste. What is not merely a matter of taste is the quality of the drive system. A model of a tracked vehicle has to get the treads right to be successful—and this one does. Individual metal links rotate realistically on drive wheels at each end and independently of each other side to side. About the only knock against them is that they’re far too clean and shiny to belong to a working excavator! 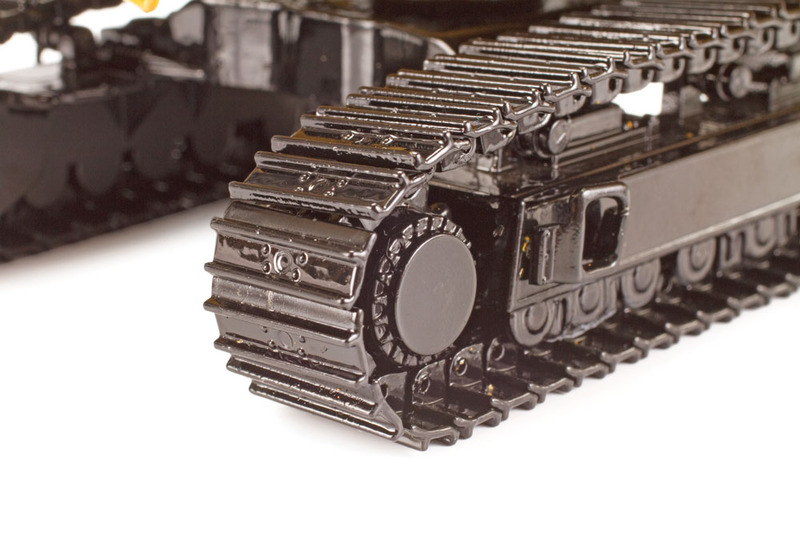 Rolling treads with individual metal links are highly realistic—except that they’re too clean! 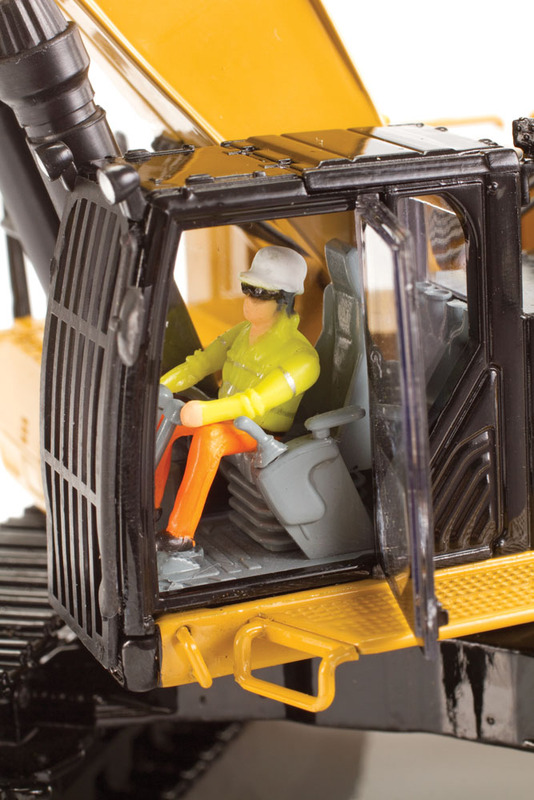 This excavator does its work with the largest 6.0 cubic-yard bucket, which is fully articulated on the model.